Analysis and Foreword by Henry Adams, Ph.D. The Bartletts had recently bought The Accent House and were remodeling it for a bed-and-breakfast. Constructed in the early 1840s, the dwelling was one of the most remarkable examples of traditional Gothic Revival style in Knox County. It was designed by William Tinsley, a prominent architect who was responsible for several famous structures in the area. Its history goes back even farther to 1800, when Col. John Francis Hamtramck gave the property to Sen. Jesse B. Thomas and William Henry Harrison. Harrison sold his interest in the property to Senator Thomas and eventually became the ninth President of the United States. When they met my father, the artist, at the show, the Bartletts asked him, given the house’s history, why had he never painted it? “Because it never was in threat of being torn down!” was his reply. Four years later, Rob Florer, a British citizen who had spent some of his youth in the house, commissioned a second version. Dad’s files tell a story of exacting detail that went into a Vernon Johnson watercolor. You can purchase a frameable print signed and numbered from a limited edition by the artist. 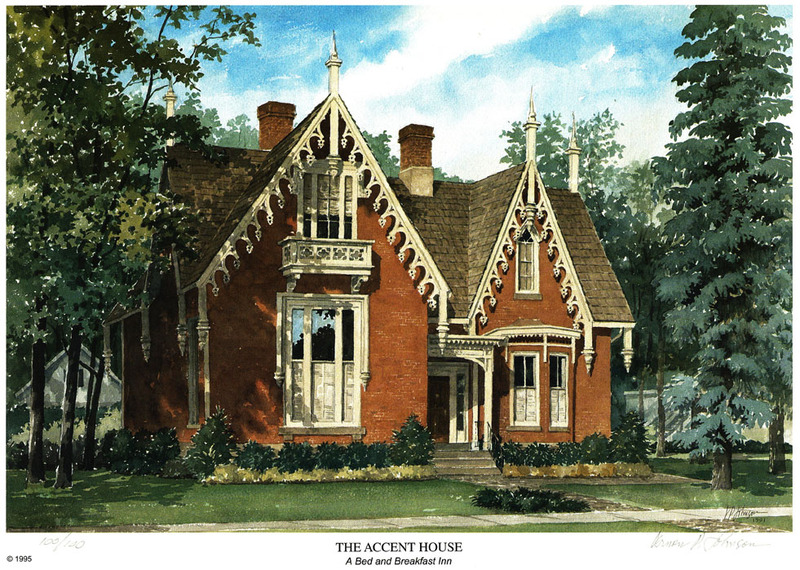 Email me for contact information and to learn more about the historic Accent House and how Vernon Johnson conceived and constructed a watercolor from multiple lenses….